Luciano Burti signed 2002 Official Ferrari Publicity Card. 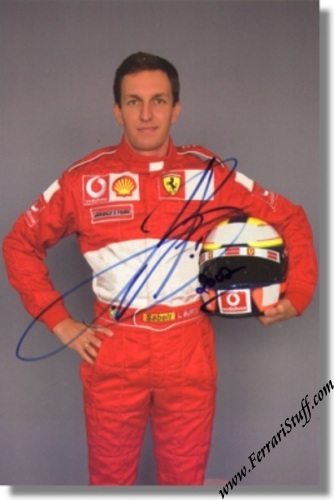 This is an official Ferrari issued publicity card of 2002 test driver, Luciano Burti. Even-though it is an official issue, it does NOT carry a print number. The card has been personally signed by Luciano with a blue marker. A great piece of Ferrari memorabilia that will surely appreciate in value over time! It measures approximately 13 x 19 cm or some 5 x 6 inches.